Barry Lutz, of Fairmount, says his American flag was stolen during the Welcome America! celebration in Philadelphia on Tuesday. The flag, pictured above, once belonged to his late father, a World War II veteran. A Fairmount resident says someone walked off with his American flag following the Welcome America! celebration on Tuesday night on the Benjamin Franklin Parkway in Philadelphia. The flag was showing its age – the color had faded and the fabric had weathered. But to Barry Lutz, it is irreplaceable. The flag belonged to his late father, Jack, a World War II veteran who would hang the flag outside his home on holidays. 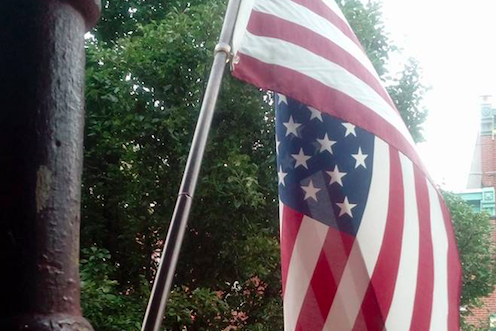 After his death three years ago, Barry Lutz upheld the tradition on his own block, hanging the flag as a tribute to his father and other veterans in the neighborhood. "One of the things that we brought back to Philly after his death was that flag," Lutz said. "It was nothing special. It was probably bought in Kmart. But it was the flag he flew outside of his house for holidays." Lutz simply wants whoever took the flag to return it to his home on the 2900 block of Poplar Street. He said there will be no questions asked. Lutz posted his request on NextDoor, a social media app that allows users to interact exclusively with the people who live in and near their neighborhood. "It belonged to my father, a World War II veteran," Lutz wrote in the post. "It is worth nothing to you, but everything to my family. Please." As of Thursday afternoon, he had not received the flag. "I've gotten a lot of sympathy," Lutz said. "So many people come through our neighborhood for the celebration that (don't) get reached by that site." 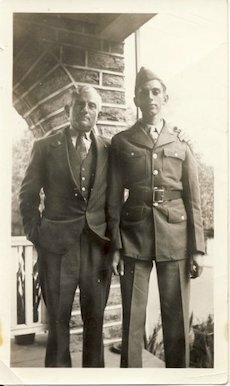 Jack Lutz, right, stands with his father, Harry, outside their home at the corner of Pratt and Akron streets in the Frankford section of Philadelphia. Each year, thousands of people flood the Parkway for the city's annual Fourth of July celebration. Many park their cars in Fairmount or pass through the neighborhood by foot or bicycle. Lutz said four flags, including his own, were taken from his block. "Someone just came through that night and just grabbed every flag they could gather and just took off," Lutz said. Jack Lutz was stationed in the Aleutian Islands during most of World War II, his son said. He served as a communications specialist, testing both the internal and external radio systems of the B-17 and B-29 bombers. He also was a disc jockey for the Armed Forces Radio Service. After the war, Jack Lutz taught at the Robert Morris School in Brewerytown and served as a principal of three elementary schools in the Plymouth-Whitmarsh School District in Montgomery County. He later spent three decades in Africa, holding varying roles at schools in Ethiopia, Nigeria and Sierra Leone. In 1996, Jack joined the Peace Corps and taught college in Poland for several years. Barry Lutz had taken to honoring his father by hanging his flag. "This is the first thing that I've ever had stolen that's not replaceable," he said. "That's a new thing for me."